Nigeria will have to wait to seal their place in the 2018 World Cup, after they were held to a 1-1 draw by Cameroon on Monday night. 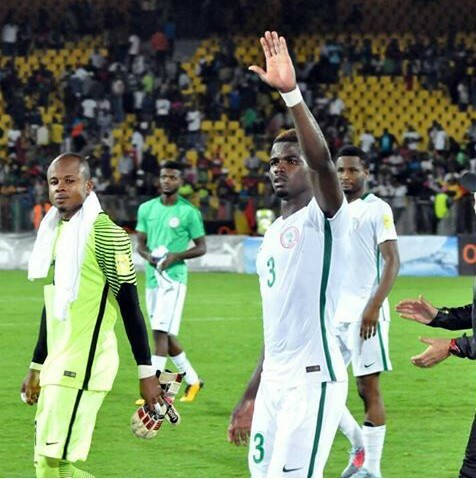 The Super Eagles came into the encounter, three days after hammering the Indomitable Lions 4-0 in Uyo, Akwa Ibom and a win would have confirmed their qualification. Gernot Rohr’s men survived early pressure, before they took the lead through Simon Moses, who lashed in a loose ball in the area. Nigeria squandered several chances to double the lead, before goalkeeper Ikechukwu Ezenwa fouled Djoum Arnaud inside the area. The referee pointed to the spot and Vincent Aboubacar kept his nerves to make it 1-1 with 15 minutes left. The result sees the Eagles remain top of Group with 10 points, while Zambia who play Algeria on Tuesday are second with four points. Cameroon are out of the running for the 2018 World Cup.